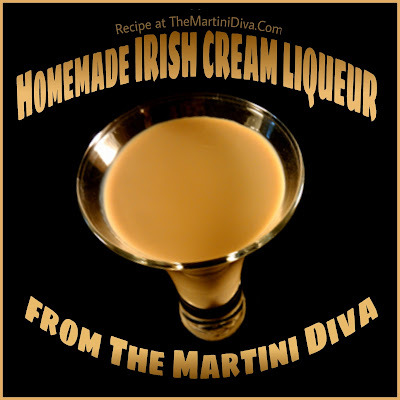 Irish Cream Liqueur is a standard bar staple because it's used in so many cocktail recipes. It's one of the liqueurs you should always keep stocked at home because of it's versatility. It's one of those liqueurs that you can just splash into a cup of coffee for a little warm up or simply chill and sip. When most people think Irish Cream Liqueur they think Bailey's but there are many other brands out there as well, including St. Brendan's and Carolans. Of course, you can also make your own and below is my favorite recipe. Tools: Blender, measuring cups and spoons, decorative bottles for finished liquor, Personalized Labels. Put all the ingredients in a blender and blend for about a minute. Pour into your decorative bottles, seal, label and let infuse in the refrigerator for up to a month. When you’re ready to use remember to shake before you pour. This should keep in your fridge for several months – if it lasts that long.